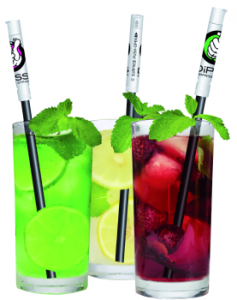 DiPSS holds a surprise effect in store: The individualisable straw attachment can be filled with a message in the form of a note and can be opened using just one small movement of the thumb. Whether for a trade fair, company celebration, festival or branch opening, night club, beach bar or cinema – the simple and equally original means of communication can be implemented in versatile ways and among others has already proved its value in the course of a Johnnie Walker campaign in Greece, where 200,000 straws with the cap attachment and a log-in code revealed inside were distributed in 800 bars and outlets. At the end of the campaign four times the amount of people had registered compared to a similar campaign using scratch cards. The logical consequence: A distinction in the category Give-aways. DiPSS is made in Europe out of recyclable materials and is available in all colours as well as with an individual all-round imprint. The length, colour and diameter of the straw are freely selectable.